Associated Press is reporting that Andre Thomas, a Texas death row inmate pulled out his only good eye and told officers he ate it. He had already pulled out his other eye in 2004 while awaiting trial in Sherman. He was ruled competent to stand trial. This is a disturbing case of Texas' incompetence in addressing the needs of the mentally ill and also the injustice of executing the mentally ill and retarded. 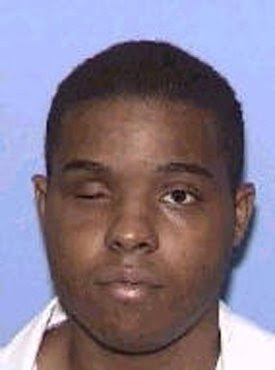 HOUSTON — A Texas death row inmate with a history of mental problems pulled out his only good eye, authorities said Friday. Andre Thomas told officers he ate it. Thomas, 25, was arrested for the fatal stabbings of his estranged wife, their young son and her 13-month-old daughter in March 2004. Their hearts also had been ripped out. He was convicted and condemned for the infant's death. While in the Grayson County Jail in Sherman, Thomas similarly had plucked out his right eye before his trial later in 2004. A judge subsequently ruled he was competent to stand trial. A death-row officer at the Polunsky Unit of the Texas Department of Criminal Justice found Thomas in his cell with blood on his face and had him taken to the unit infirmary.